Max Spindle Speed: 750 Rp. This is Auto Lathe Machine with double copying slide for turning, facing and boring etc. This is hydraulic plc control machine. This machine use for tie rod housing, gear blank, flanges, sprocket etc. Front slide, drill slide, one vertical. Front slide, stop bar, one collet. One drill holding plunger with collet. Electric drive motor coolant pump, electricals. One set of cams, bar feed. One set of tool holders. We offer our client an excellent quality range of light duty all geared lathe machines, which are manufactured from high grade quality raw materials. These light duty lathe machine can be customized as per our precious customers specifications. These light duty lathe machine are widely known for its durability and quality. 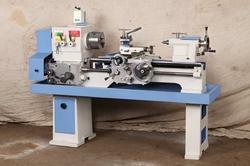 Our light duty lathe machine can be availed at industrial leading price.